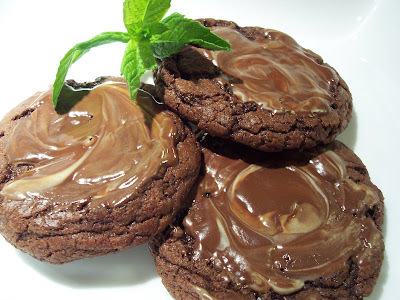 After much anticipation the winning recipe for the last poll was Mint Chocolate Chip Cookies. Thanks to everyone who voted! I have added a new poll, one that is in honor of Martha. I picked 4 recipes from her cookie of the day section. You can look for the individual recipes here before you vote. 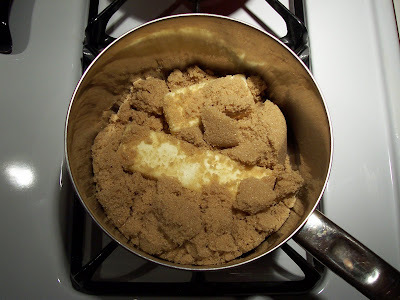 In a saucepan over medium heat, cook the sugar, butter and water, stirring occasionally until melted. 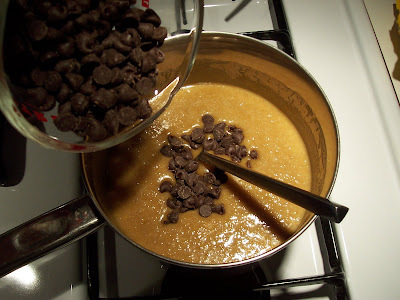 Remove from heat, stir in the chocolate chips until melted and set aside to cool for 10 minutes. I was so tempted to eat that right out of the pot right then and there...but I didn't. 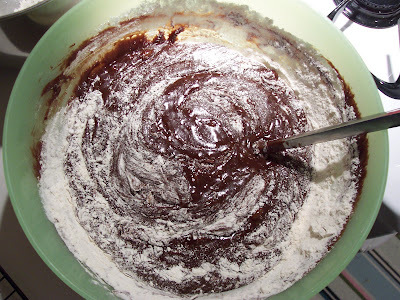 Pour the chocolate mixture into a large bowl, and beat in the eggs, one at a time. Combine the flour, baking soda and salt in a separate bowl. 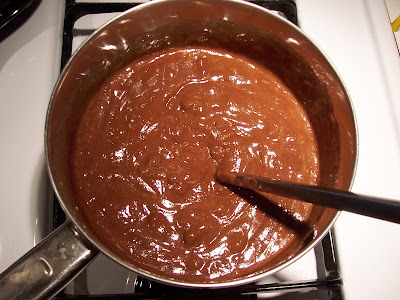 Stir into the chocolate mixture. 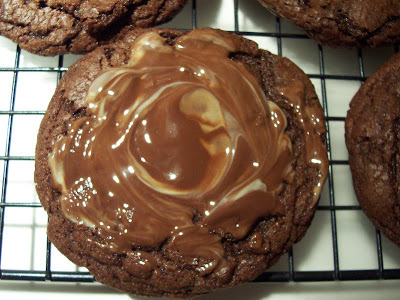 Let the dough sit until it is room temperature then stir in the small semi sweet chocolate chips. Cover and refrigerate dough for at least 1 hour. Preheat oven to 350 degrees F. Grease cookie sheets. 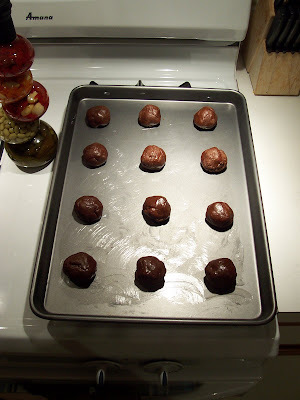 Roll cookie dough into walnut sized balls and place 2 inches apart onto the prepared cookie sheets. I wanted to eat those little round chocolaty treats right then and there...but I didn't. 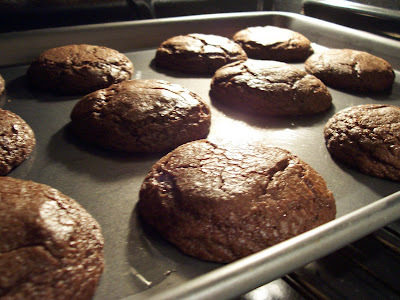 Bake for 10 to 12 minutes in the preheated oven, be careful not to over bake. 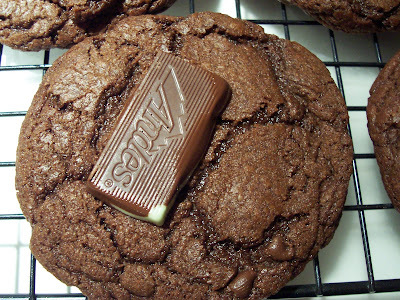 When cookies come out of the oven, Press one mint wafer into the top of each cookie and let sit for 1 minute. When the mint is softened, swirl with the back of a spoon or toothpick to make a pattern with the green filling of the mint wafer. 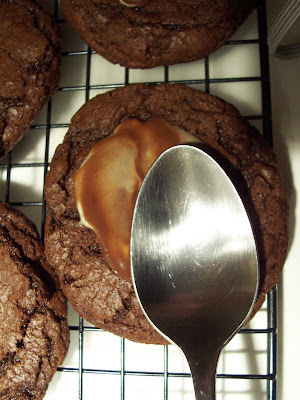 Let cookies cool for about a half an hour. Now eat them!! I was tempted...so I did!! Your photos rival those of Martha Stewart... but your Post-It illustrations far surpass anything on her site!